Language: English is the official language, with Fijian and Hindi used widely. Population: 826,000 (2002). Fijians 53%, Indo-Fijians 40%, remainder Chinese, European, other islanders. Money: The Fiji dollar (2005) is worth about US$0.60. Landscape: There are 333 islands in the Fiji group. The eastern sides of the main islands are wet and tropical with semi-depleted rainforests. The western ends are drier and sugar-cane is grown there. The Yasawas and Mamanucas, to the west of Viti Levu are hilly and dry. Visited: Arrived 7 October, 2004 in Suva, and stayed exactly 1 year (minus two months in the States). After a 3-day sail from Neiafu in the Kingdom of Tonga, we arrived in Suva, the capital of Fiji in October, 2004. We chose Suva instead of the more yacht-friendly Savusavu because Chris had to take some university entrance exams (SATs), and they were only offered at the International School in Suva. The first three months we were in Fiji we spent between Suva in eastern Viti Levu, and Savusavu on southern Vanua Levu. It was a bit of a balance between big city and no cruisers vs. small town and yachties. We spent Christmas and New Years with several cruising friends in Savusavu. If you're planning to make the seemingly simple passage from Tonga to Fiji, check out our Passage Dangers page. It lists the locations of about 60 uncharted hazards between Tonga and Fiji, as well as a file you can download into MaxSea to automatically plot those hazards. When Jon's father - and later Jon's niece Rori - decided to come down for a visit, we sailed to Lautoka in western Viti Levu and spent a couple months exploring the Mamanuca (pronounced mah-mah-NU-tha) Islands and the Yasawa Islands further north. We left Ocelot in Musket Cove while we visited family in the States in April/May 2005. Upon our return to Fiji in June 2005 we had another niece, Emmy, come visit, and with her we sailed to the southern islands of Fiji. The last few weeks of our year in Fiji were spent with yet another niece at Musket Cove in the Mamanucas and Robinson Crusoe Island on the south coast of western Viti Levu. Be sure to check out our Fiji Newsletters and Diving Fiji pages for more information and photos. Pre-History: Fiji was first settled in about 1500 BC by the Lapita people, who probably came from Vanuatu or the eastern Solomon Islands. They called their land Viti. These people lived on the coast and relied on the sea to live. Around 500 BC there was an agricultural expansion, due to an increased population, which brought inter-tribal feuding to the relatively peaceful people. Cannibalism appeared at this time and continued off-and-on until about 100 years ago. Larger-scale wars started about 1000 years ago, when Tongans and Samoans started invading from the east. This barrage was not constant, and though there were periods of peace, the tribal skirmishes that filled the gaps were almost fierce enough to be considered civil war. Viti was never unified, though trade networks eventually extended to Tonga and Samoa. Village life and hierarchy was convoluted and intermingled, often due to the polygamy of chiefs. The appointment of a new chief was usually hotly debated and power struggles were common when a chief died, resulting in feuds and wars between neighbors – who were invariably related in some way or another. The first European to sail through Fijian waters was Abel Tasman in 1643. Europeans explorers crossed the southwest Pacific all through the 17th and 18th centuries, attempting to find the “unknown southern land” or terra australis incognita, but Tasman was simply en route to the East Indies. His experience of navigating the treacherous reefs to the north of Vanua Levu, however, dissuaded mariners from returning for almost 130 years. James Cook heard from the Tongans of the Fijian reputation for ferocity and cannibalism, and although he visited the Lau Group in 1774 without incident, his recounting of stories deterred explorers even longer. Captain William Bligh and his officers passed through the passage between the two main islands in 1789, and his subsequent trip in 1792 started the Europeans looking towards Fiji. Suppressing anxiety due to reefs and cannibals, whalers and traders started making their way to Fiji regularly in the early 19th century. They acquired sandalwood and bêche-de-mer (sea cucumbers) from the islanders, and in return introduced firearms and foreign ideals. The Fijians were initially satisfied with barter for their wood, but eventually started demanding European assistance in their wars against neighboring chiefs. Neither the sandalwood trade nor the sea cucumber trade lasted a full 20 years, due to overexploitation. In the area around Bau in western Viti Levu, chiefdoms were expanding vastly from the 1840s to the 1850s. Chief Ratu Seru Cakobau of Bau was known to foreigners as Tui Viti, the King of Fiji, although he only controlled a quarter or a third of the land. He abused his power and traditional customs, and managed to alienate many of his former allies. Vicious power struggles between what could almost be called the leading powers of Fiji followed. These powers became dependent on the superior Tongan canoes, however, and Bau even received military support from the Tongans. One Tongan noble, Enele Ma’afu, attempted to invade and capture an island in the Lau Group, consequently annexing it to Tonga and converting the people there to Christianity. He became the governor of all Tongans in the Lau Group, and soon rivaled Chief Cakobau for power. By the late 1850s, Tongans were the leading force in eastern Fiji. Missionaries started arriving in the 1830s to preach against cannibalism and for Christianity. Their progress was slow as the Fijians were reluctant to give up their gods, but they did manage to develop the language system used today. Several chiefs finally converted, setting a precedent for their villagers and the chiefs under them. Chief Cakobau reluctantly adopted Christianity when he was threatened with the loss of Tongan military assistance. The Methodist Church saw this as a great triumph. Reverend Baker set out through the highlands to spread the gospel, but apparently didn’t realize that many villages wouldn’t take kindly to suggestions of associating with Bau. He was killed and eaten in 1867, one of the few missionaries who was actually cannibalized. Missionaries and Europeans turned tribal dress conservative, some disfiguring tribal initiation rituals were discouraged, and intertribal warfare suppressed. Priests of the old religion were replaced by missionaries and Fijian ministers, who stepped up to high a social positions. Many Fijians, however, adopted Christianity alongside their traditional spirituality rather than instead of it. A whaling and beachcomber settlement was established at Levuka in the 1830s, and the town became one of the main ports of call in the South Pacific. In 1840, a US expedition to Fiji - which included scientists, artists, and linguists - produced the first reasonably accurate and complete charts of Fiji. Commandant Charles Wilkes also negotiated with the Chief of Bau to form a port-regulation treaty – payment in return for provisions and protection while in port. This relationship collapsed in 1841 when Levuka was put to fire. Cakobau was believed to have instigated the act, but it was never proven. In 1849, a US official’s home was accidentally torched and locals helped themselves to his possessions. Cakobau, as King of Fiji, was held responsible and given a damage and compensation bill. Due to that (and other) incidents, Cakobau soon owed an inflated US$45,000. In 1862, Cakobau offered to cede Fiji to Britain in order to clear his debts. The offer was not seriously considered at this time, but more interest was shown in the form of British representatives and an influx of British settlers. Cakobau’s debt was paid in 1868 by the Australian Polynesia Company in exchange for land. The worldwide cotton shortage due to the American Civil War created a cotton boom in Fiji, and Europeans brought other Pacific Islanders to work the cotton, copra, and sugar plantations. This developed into a kind of indentured servitude and almost slavery of a sort, with chiefs trading laborers for ammunition. This developed even more into the fine art of organized kidnapping, or black-birding. Pressure was put on Britain and an Imperial Kidnapping Act passed, but it had little impact on the islands. Cakobau made several attempts to form a Fijian government but each time his attempts failed. In 1873, Britain considered annexing Fiji. The abolition of black-birding was their principle justification. Cakobau was agreeable and Fiji became a crown colony on October 10, 1874. The Deed of Cession was signed by Cakobau, Ma’afu (chief of Lau and much of Vanua Levu), and 11 other chiefs, all but one of whom happened to be from eastern Fiji. Cessation was not unanimously accepted by Fiji’s high chiefs. Colonial Era History: After the end of the American Civil War, the world cotton market took a slump. An economic depression spread through Fiji. Along with this came a flood of epidemics, with one measles outbreak killing about a third of the indigenous Fijians. Social unrest rose and European settlers, greatly outnumbered, feared a racial war. The colonial government collaborated with the Council of Chiefs to create a more smoothly-governed Fiji. 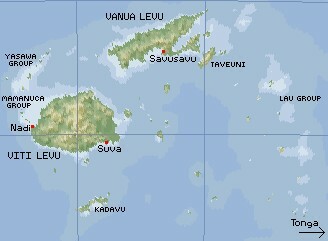 The capital moved in 1882 from Levuka to Suva, where the geography allowed more expansion. This colonial government took a strong interest in protecting the indigenous Fijians from exploitation in several ways. There was already a policy forbidding land sales to foreigners, in order to protect Fijian land rights. As a result, 83% of the land is still owned by Fijians today. Foreigners were also prohibited from using Fijians as plantation laborers. The Fijians themselves tended to prefer lighter, less structured work that didn’t disrupt their traditional village life. In 1878 indentured laborers started coming to Fiji from India, almost 2,000 a year. About 80% were Hindu and 14% were Muslim. Many of them were tricked into thinking that Fiji was a place of fine prospects. Instead, they entered into 5-year contracts of heavy work, not much food, and withheld wages. Laborers of different castes and religions were forced to mix, and no traditional religious education was available for children except for the Christian missionary schools. Despite their suffering, most of the Indians decided to remain in Fiji after their contracts were fulfilled, even bringing family members over from India. Indenture ended in 1919 after much pressure was put on the Indian government. Most of the Indians (now referred to as Indo-Fijians) in Fiji moved into small business or trade, with some becoming independent farmers. They were discouraged from associating with the indigenous Fijians. The first Fijians included in the Legislative Council were nominated 25 years before the first Indian was elected to government. Fijians and Europeans banded together in the 1920s against the Indian-dominated workforce in response to the fear that the Indian population would surpass that of the indigenous Fijians. Fiji participated in World War 2 by sending about 8,000 soldiers to fight the Japanese in the Solomon Islands. These soldiers, part of the Fiji Military Force, were largely trained by Americans and New Zealanders. Indo-Fijians didn’t rush to join the fighting, and their resentment of past injustices was taken for cowardly anti-patriotism. After WWII the idea of democracy must have been burned into the Fijian mind. The 1960s was a huge step for them, with a ministerial government, political parties, voting rights, and a move towards self-government. More and more representatives in government were being elected rather than nominated. Fiji became independent on October 10th, 1970, after nearly a whole century of colonial governing. Many problems involving the racial mix in Fiji were not resolved at this time, however, and still plague the country. Post Independence History: In October, 1970, ninety-six years after being colonized by the British, Fiji gained independence. The country still had to deal with racial issues such as land ownership, voting rights, etc. but it prospered in the 1970’s with a high world price on sugar (the mainstay of their economy). The first elections brought the indigenous Fijians to power, opposed by Indo-Fijians (whose party included both Hindus and Muslims). In the mid-1980’s a new labor party was formed with both Indo-Fijian and Fijian members. They defeated the Alliance party in 1987, and although the prime mister was Fijian, as were the majority of cabinet members, it was perceived as being “Indian dominated.” This lead to civil unrest and increased racial tensions as extremists led by Lt. Col. Sitiveni Rabuka fired the Fijians with fears of losing their land rights and suppression by the Indo-Fijians. In a bloodless coup Rabuka took the reins of government and appointed a new cabinet, composed mostly of members of the Alliance party, and supported by the Great Council of Chiefs. Five months later he proclaimed himself head of state, invalidated the constitution of 1970, and appointed new ministers. It was a dark period in Fiji’s history with a national curfew, newspapers closed, and arrests of community leaders and academics. Fiji was dismissed from the British Commonwealth a month later. Although it is easy to point the finger of blame at the Fijian/Indo-Fijian differences, but in truth there was much infighting amongst the Fijians: elite vs. laborers, chiefs from the east vs. chiefs from the west, rural vs. urban, church vs. trade unions, etc. Following the coups the economy plunged, with the sugar harvest interrupted and international tourism effectively halted. By 1990 President Ganilau created a new constitution giving increased power to the Great Council of Chiefs and the military, and diminishing power to Indo-Fijians. He imposed compulsory Sunday observance, thus imposing Christian religious values on the Hindu and Muslim population. Indo-Fijians protested, and there was unrest for a decade. In 2000 the first Indo-Fijian prime minister, Chaudry, was elected, but was overthrown in a coup a year later, led by failed businessman George Speight. Speight’s rebels together with the military formed an interim government and released the hostaged prime minister and others. When Speight threatened the life of the new president he was arrested for treason and sentenced to death, which was soon commuted to life imprisonment. Elections were held under UN supervision and an uneasy peace has settled over Fiji. In 2005 the hottest political issue was the possible passage of a (very poorly named) Bill of Reconciliation, which would pardon Speight and the other rebel leaders of their treasonous actions. The Indo-Fijians feared that the bill’s passage would give birth to further government sanctioned hostilities against the Indo-Fijians and would turn Fiji into a lawless state. We all sincerely hope that this will not come to pass.